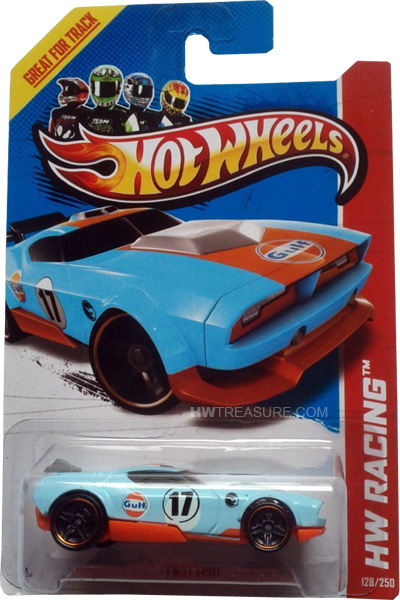 128/250 is part of the HW Racing series and the 2013 Treasure Hunt set. 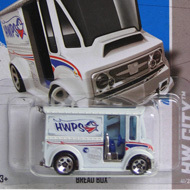 The light blue Fast Fish is detailed with an orange stripe on top, the Gulf logo on the sides and hood, as well as “17” and the low production symbol on the sides. It has tinted windows, chrome interior, black PR5 wheels with orange chrome rims, and an orange plastic Malaysia base. 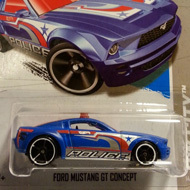 This futuristic muscle car first appeared in the 2008 New Models series. It is a unique design with a clear hood bulge that displays its engine.